Piping has a firm tradition in the Royal Air Force, going back virtually to the formation of the Service and, together with a wide range of semi-official corps of drums, brass bands and military bands, provided the basis upon which such prestigious bands as the Central Band of the RAF were formed. 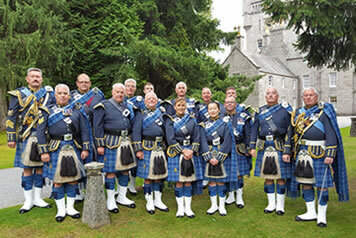 Today, the backbone of the RAF's five pipe bands is provided by RAF tradesmen, their officers, and civilian volunteers and are formed on a geographical basis from RAF Stations throughout the United Kingdom. RAF Halton, just outside Aylesbury, is the oldest of these voluntary pipe bands, and is considered to be the home of piping in the Royal Air Force. Ever since the days when Halton was No.1 School of Technical Training in the RAF (the photo above is the massed bands of No1 School from 1930), each of the three wings of aircraft apprentices had their own Pipe Band to march them to and from the workshops each day - from this tradition, the current Halton Pipes and Drums continues to the present day. The RAF's five pipe bands regularly combine to represent the RAF in State ceremonial or other major public events. Indeed, exposure of RAF piping and drumming at home and abroad continues to gain an increasingly high profile and is held in high regard across the piping community. RAF Halton's bandsmen have performed at many high profile events around the world - the Edinburgh Military Tattoo, the Jools Holland Hootenany (BBC1), international Tattoos in Sydney, Melbourne, Wellington, Basel and Berlin, t' Hertogenbosch, a competition in Belgium, a festival in Italy and the International Celtic Music Concert in Bordeaux, France. The RAF 100th anniversary saw pipers and drummers playing down the Mall and at Buckingham Palace as well as for Her Majesty the Queen at Balmoral. The band's tartan, until 2004, was Douglas. King George V granted permission for the Royal Air Force to wear Grey Douglas in 1937, and RAF Halton finally adopted Green Douglas in 1968. For the Royal Edinburgh Military Tattoo 2004, bandsmen from the five RAF pipe bands were issued with the RAF Tartan for the first time. The employment of professional Pipe Majors in the RAF has assured the development, ability and standing of RAF piping. Led by the Pipe Major, the majority of today's band members are civilian with a nucleus of RAF personnel, ranging from the more established musicians, to talented up and coming youngsters - all of whom have won awards too numerous to mention here. RAF Halton Pipes and Drums practise weekly at RAF Halton (near Wendover) on Thursday evenings. New pipers and drummers are always welcome to come along and join in - expert tuition is always at hand. If you think you would be interested in joining the band, email the Pipe Major and take the first step. 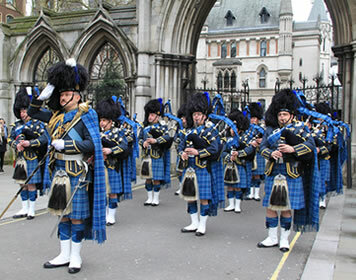 The opportunities available to pipers and drummers in this band are unique to the RAF voluntary pipe bands. The band is always happy to quote on all kinds of functions, large or small with the size of band adjusted to suit the occasion and funding available. For that really special event why not ask for a piper or two, in full highland dress. A warm invitation comes with a golden opportunity, to include something really special. Nothing is more spectacular than the musical spirit of the lone piper. For explosive impact, watch the combination of the drums and pipes capture the awe of your guests and applaud the emotive result. So promote your event and delight your guests, not with any band, but with RAF Halton Pipes and Drums. We're a guaranteed show stopper!